Now that autumn has arrived, it is time to put up some seasonal decorations. Some people think it is too early for out-and-out Halloween decorations, but you can start your spooky decor with a layer of fall-themed arts and crafts from the kids. Rainbow Chimes uses active learning to teach children to construct their own understanding of the world by asking questions, trying solutions out and figuring things out for themselves. You can continue this method at home simply by doing activities with your children, such as observing the change in the seasons and talking about it. Doing an activity or arts and crafts that reinforce ideas based on your observations will deepen their understanding. To get ideas for activities to do with your kids, keep reading. There is no rule that says craft projects with kids can’t be educational too. Every time you do seasonal crafts is an opportunity to teach children about nature. Taking time to sit down and make some art with your child lets you see what they’ve learned, and gives you the opportunity to just be with them in the moment and that is good parenting! 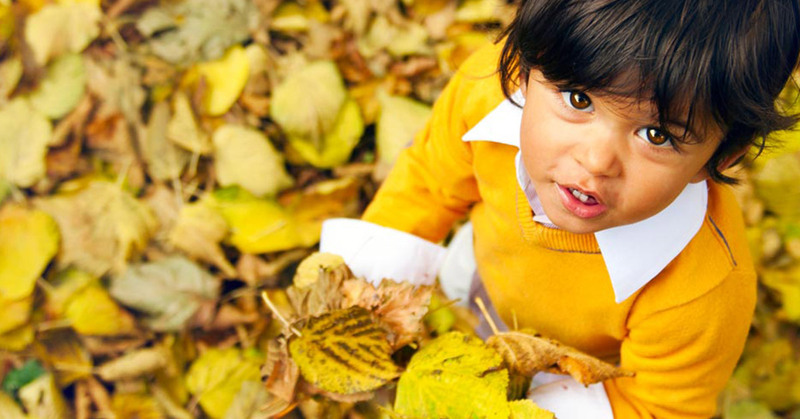 Children learn through repetition and if they learn about the season every year, they will grow up to have a deep understanding of the seasons. At a young age, they don’t need to learn about the orbit of the planets of the sun, they can just learn that the days are getting shorter and that winter is coming. Create art and fond memories by taking a walk with your child and observe nature together. Take a wagon along and gather beautiful leaves, acorns, and whatever other seasonal treasures you find. When you get home, get the glue out and have them make a collage of the treasures. Bird migration season is well underway, but there are still plenty of opportunities to teach children about birds. The Canada Goose is common in this area and children can learn about them, point them out to parents, and make construction paper geese to decorate the windows of your home. It may seem a bit early to start with turkey decorations, but as they can increasingly be seen on the sides of the road in our area, learning about these large birds can be fun. Another bird to be on the lookout for is Red Winged Blackbirds. These common birds nest in marshes and make a distinctive sound, but in the fall they flock together in large groups and watching them deftly maneuver can be a seasonal joy. One fun arts and crafts idea is to draw the outline of the bird and let the child make a mosaic using seeds such as sunflower seeds and pumpkin seeds. One of the best ambassadors of autumn is the pumpkin. Whether they are big or small, all kids and most grown ups love pumpkins. You can grow them, draw them, draw on them, eat them, throw them, and, of course, carve them. Cutting one open and pulling out the seeds and goop can fascinate a child. If you separate the seeds and roast them, you can have a tasty treat too! Alternately, you can save some of the seeds to plant next summer. Late June is the best time to plant pumpkins for a fall harvest. Rainbow Chimes loves teaching kids about the world, the seasons, and in the process, how to figure things out for themselves. The skills taught through the High Scope Curriculum at Rainbow Chimes have scientific data behind them that show great results that last over the course of a lifetime. If you are interested in enrolling your child in a day care that prioritizes life skills and education, call Rainbow Chimes and schedule a tour of our facility.